Start at any of the following locations: Portland Archives & Records Center, Multnomah County Central Library, or the Oregon Historical Society. 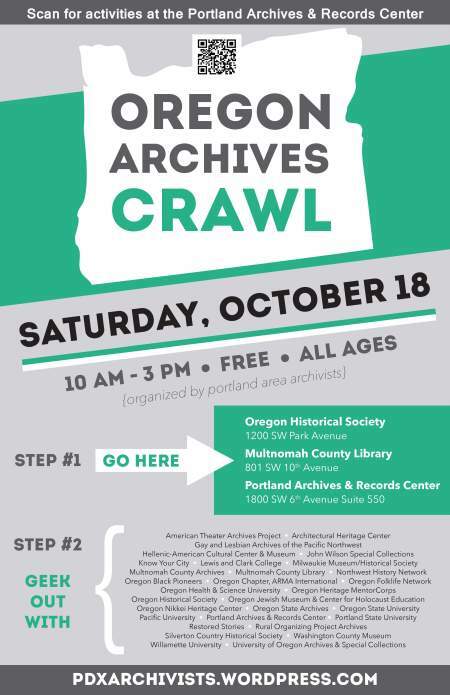 Everyone is invited to join us for the Fourth Oregon Archives Crawl this October 18th, between 10 a.m. and 3 p.m., in celebration of Oregon Archives Month. Travel between the Portland Archives and Records Center (PARC), the Multnomah County Central Library and the Oregon Historical Society. At each location there are a variety of activities to choose from so you might want to start early! At PARC, get a behind the scenes look at a sample of the many collections found in the City’s archives; listen to speakers discuss fascinating archival resources; and meet the archivists who manage some of the most exciting historical collections in Oregon. Several archives and heritage organizations will be represented at PARC, including Oregon Health & Science University Historical Collection & Archives, Oregon Nikkei Legacy Center, Willamette University Archives, Oregon Jewish Museum, Lewis & Clark College Archives & Special Collections, Oregon Black Pioneers, Pacific University Archives, Portland State University Special Collections & University Archives, Portland State University Architecture, Engineering, and Construction Archives and OSU’s Oregon Multicultural Archives and Oregon Hops & Brewing Archives. Each year we have new things to do and see, so even if you’ve already been to the Oregon Archives Crawl, you’re sure to have a great time. And if this is your first time to the Crawl, you’re going to be amazed by the diversity of historical collections available in Portland, and throughout Oregon. Remember: you don’t have to be a student or scholar to be interested in the past; history and archives are for everyone!